Next weekend, Hofstra University will be site of “Long Island’s Largest Sports Collectible Show,” which boasts “over 300 tables” of sports memorabilia for sale as well a number of autograph guests. On Saturday, Oct. 25, Mets Hall of Famer Rusty Staub and current Mets outfielder Matt den Dekker highlight an autograph slate that also includes former Mets coach and manager Frank Howard, 1969 Mets catcher Jerry Grote, former Mets pitcher Frank Viola, and baseball Hall of Famers Phil Niekro and Andre Dawson. Autograph fees range from $15 for Grote to $49 for Dawson. Howard will sign one item for free with paid admission to the show. Sunday’s lineup includes five members of the 1986 Mets: Mookie Wilson, Doug Sisk, Rafael Santana, Danny Heep and Kevin Mitchell. Autograph fees are $25 per player, except for Sisk who will sign one free autograph with paid admission to the show. Details and guests are subject to change. For the most up-to-date information, visit www.nyshows.org. 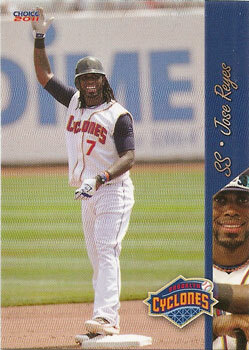 Jose Reyes was only a Cyclone for a day, but the moment is immortalized on cardboard in the 2011 Brooklyn Cyclones team set. 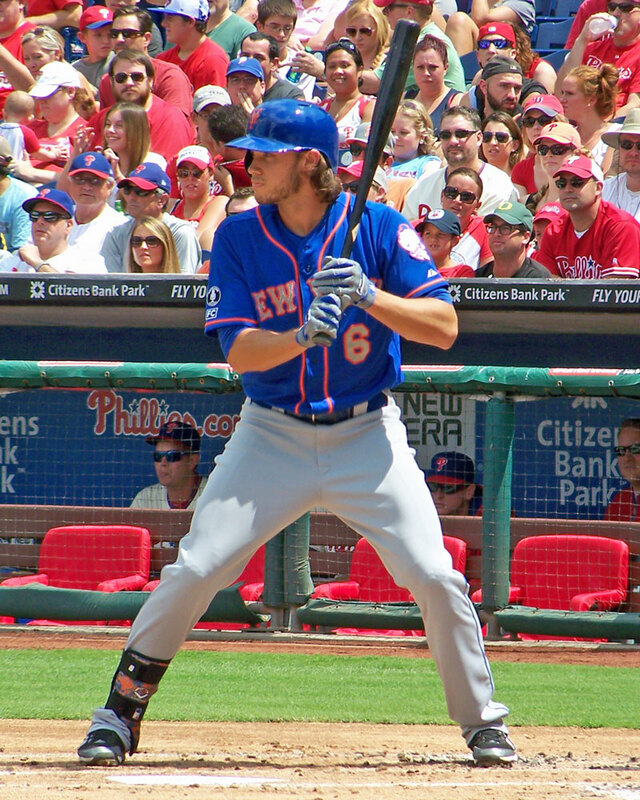 On July 18th, the Mets star shortstop played for the Cyclones to test out his hamstring before returning from the disabled list. He went 1-for-3 with a double and a run scored. Right now, Reyes is the only player in the set who’s appeared in a major league game, however that’s likely to change in a few years. The Cyclones are the Mets’ short-season Class-A affiliate; most of the players are first or second year pros – you’ll find college stats on the backs of many of the cards. Playing under manager Rich Donnelly, Brooklyn went 45-29 this season. They made the New York-Penn League playoffs, but were eliminated in the first round by the Staten Island Yankees. The Cyclones’ team set was produced by Choice Sportscards. The fronts have a glossy finish, and the backs are printed in black and white. Except for one or two draft picks who signed late, every player’s card features a game action shot for the main photo. A smaller posed portrait photo is used as a secondary image in the right-hand margin and on the back of the card. The design is simple and classy, though the script font used for the player’s name on the card front could be easier to read. Also, some of the nighttime photos could have been a bit sharper. The Trenton Thunder will put individual game tickets on sale later this morning at 9:30 a.m.
During my break at work, I’ll be calling to grab tickets for a couple I know that I will want to go to: Sunday afternoon games between the Thunder and Binghamton Mets on May 15th and June 12th. I’m sure I’ll go to more games in Trenton this season, but I’ll pick up any other tickets at the gate on days that I feel like going.